You can click Upgrade/Renew from this message or you can go to the Manage Keycodes panel as described below. In the Manage Keycodes panel, click either Renew to extend your license or Upgrade to add more seats to your license. Note: Your license is tied to a keycode, so select the appropriate row for the keycode you need to renew or upgrade. 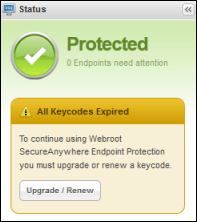 The Webroot website opens with further instructions.